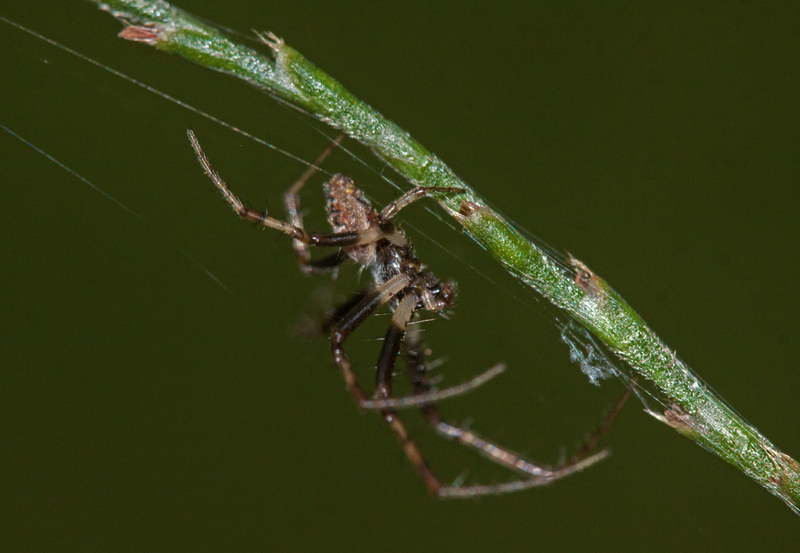 When I encountered this spider hanging on a branch just above eye-level, I knew I was going to have a problem getting a stable shooting position, so I decided to use my popup flash. It added some additional light and a little drama, though it is pretty obvious that I used it. 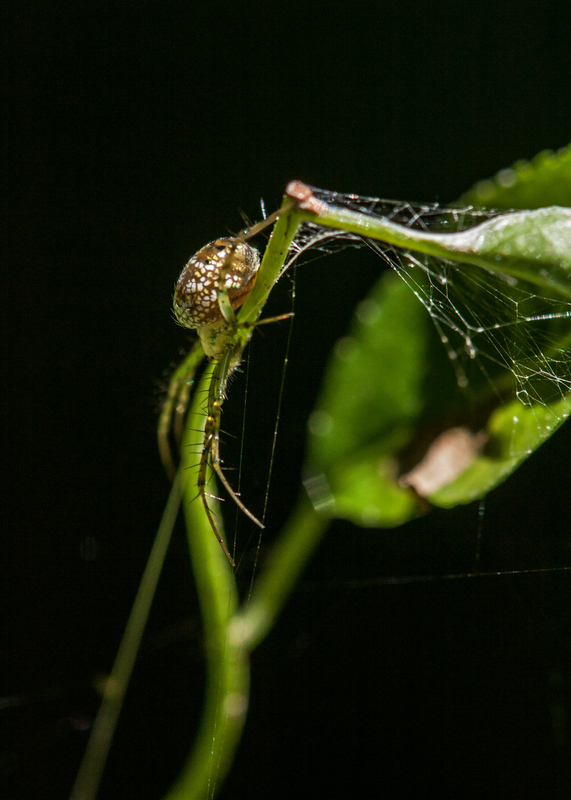 Like the spider image that I posted earlier today, the image has a really narrow depth of field, a consequence of having to shoot hand held, and only a few of the spider’s legs are in focus. This summer I haven’t been seeing any of the large orb-weaver spiders at my local marsh that I observed in previous years, but the small spiders can be equally beautiful. I spotted this little spider when I was hiking through the woods. There wasn’t really enough room to set up my tripod, so I ended up taking the shot handheld with the available light, which meant my depth of field was pretty limited. 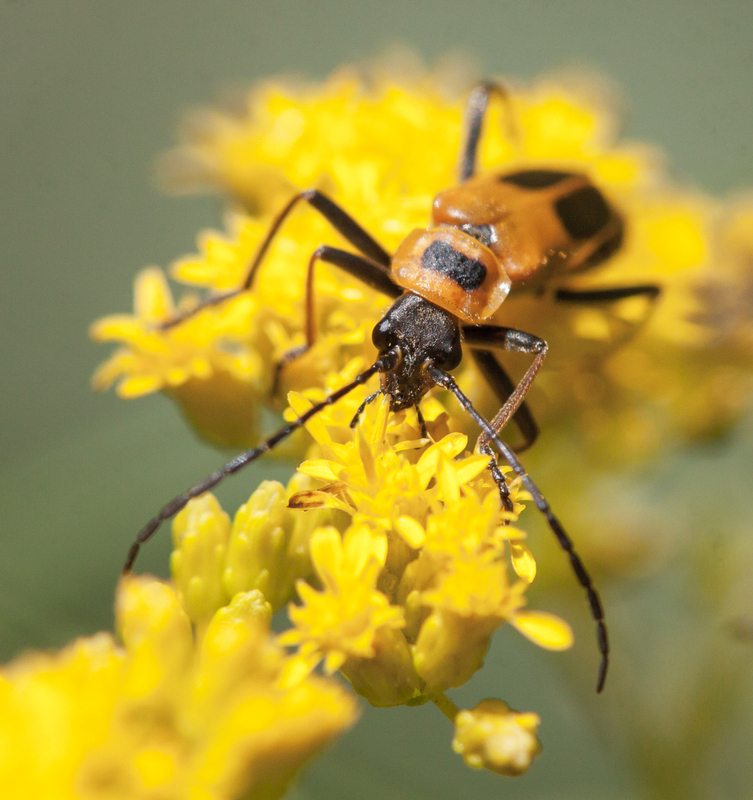 Although my normal instinct is to move in really close, I decided to take some shots from a slight distance and I like one of the resulting images so much that I am presenting it with almost no cropping (which is unusual for my insect shots). I especially like the interplay of light and shadows on the different elements in the scene, which together produce a sense of drama. 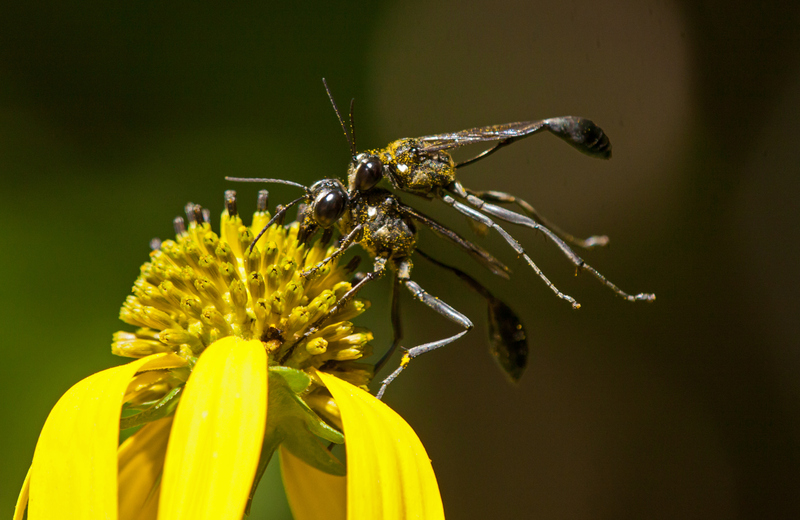 I don’t know much about the intimate life of wasps, but it sure looked to me like one of them is giving the other a loving nibble on the back of its neck. Both of them were covered in a lot of pollen, like they had just had a roll in the hay, figuratively speaking. The two of them had flown to this flower in what appeared to be a mating position, though I can’t tell if the wasps are actually hooked up in this shot. 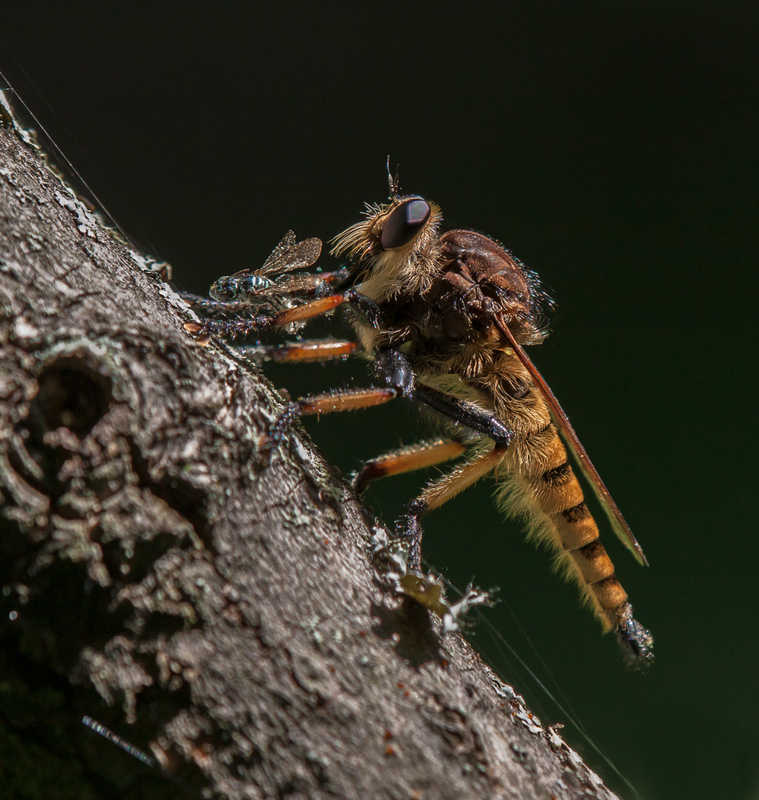 My experience with dragonflies, however, has shown me that insects can mate in all kinds of unusual positions. I am comfortable with moving in close for photos of bees, but I decided that in this case it was prudent to maintain a respectful distance from the wasps. 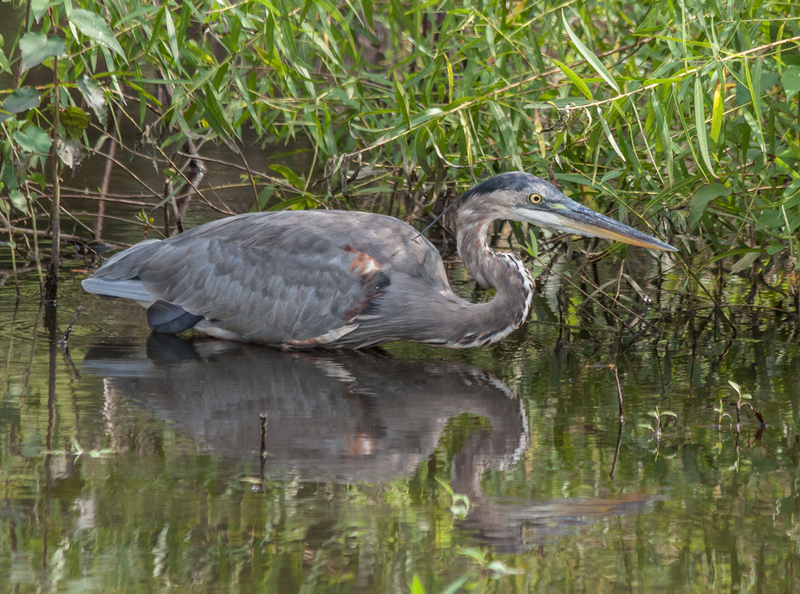 Why was this Great Blue Heron (Ardea herodias) crouching in the water? Was he playing hide-and-seek with his heron friends? Was he seeking shelter in the shade? The more that I watched the heron fix his attention on the eye-level branches, the more I became convinced that he was stalking dragonflies. Several times he advanced forward slowly, never once looking down at the water, but I never saw him make the rapid thrust that he uses when catching fish. It seems to me that he would get a better reward for his efforts by catching fish and frogs, but maybe he simply wanted some variety in his diet. When I departed, the heron was still crouching and the dragonflies remained hidden. 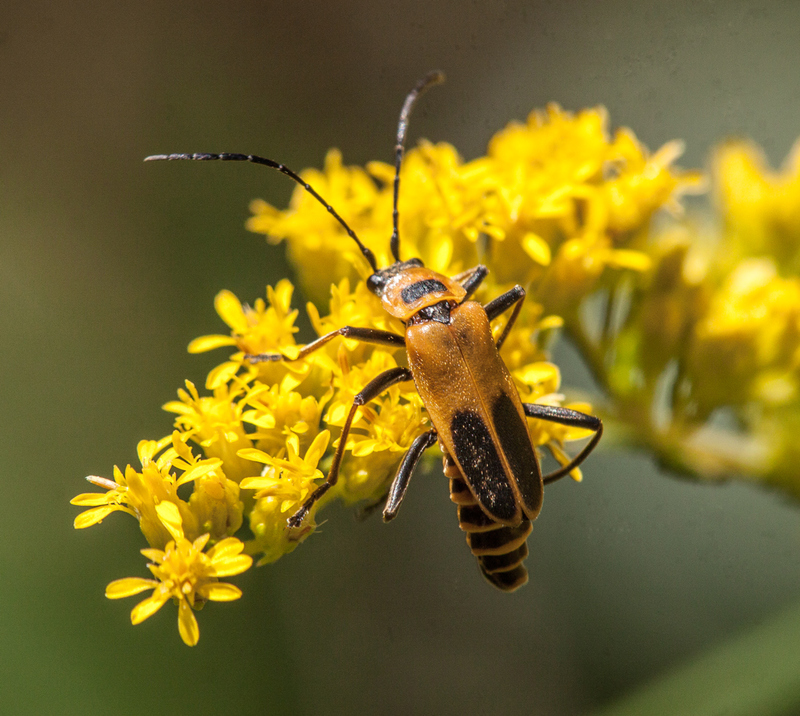 Goldenrod seems to act like a magnet for all kinds of flying and crawling insects and earlier this week I was fascinated by a large beetle crawling around and through the goldenrod. 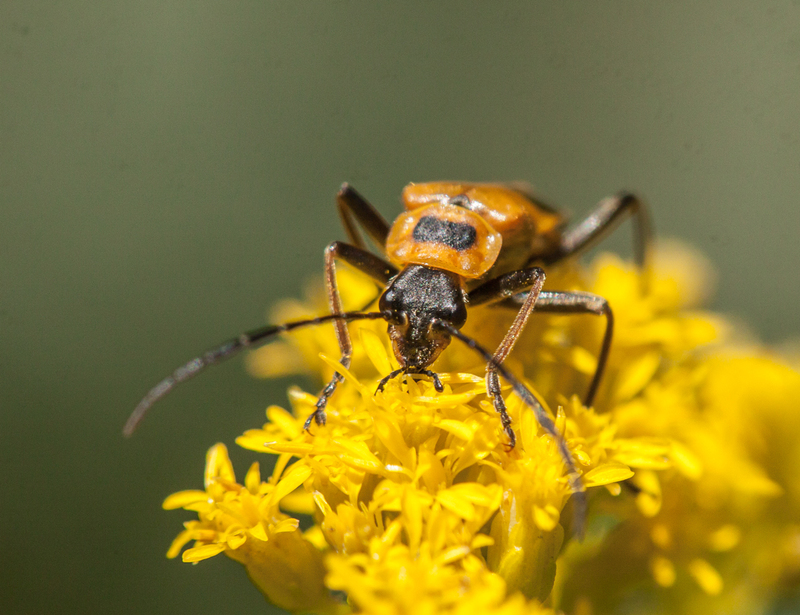 I haven’t yet been able to identify the beetle, but I had a lot of fun trying to move in close with my macro lens and capture its image from various angles. 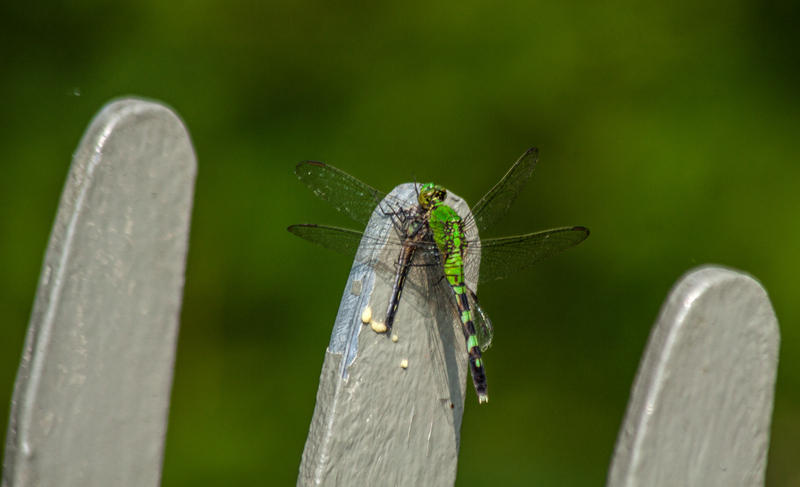 Dragonflies are so beautiful that I sometimes forget that they are also fierce predators. Last weekend at my local marsh, I captured this image of a female Eastern Pondhawk dragonfly (Erythemis simplicicollis) feeding on another dragonfly, which looks like it might be a female Blue Dasher (Pachydiplax longipennis). 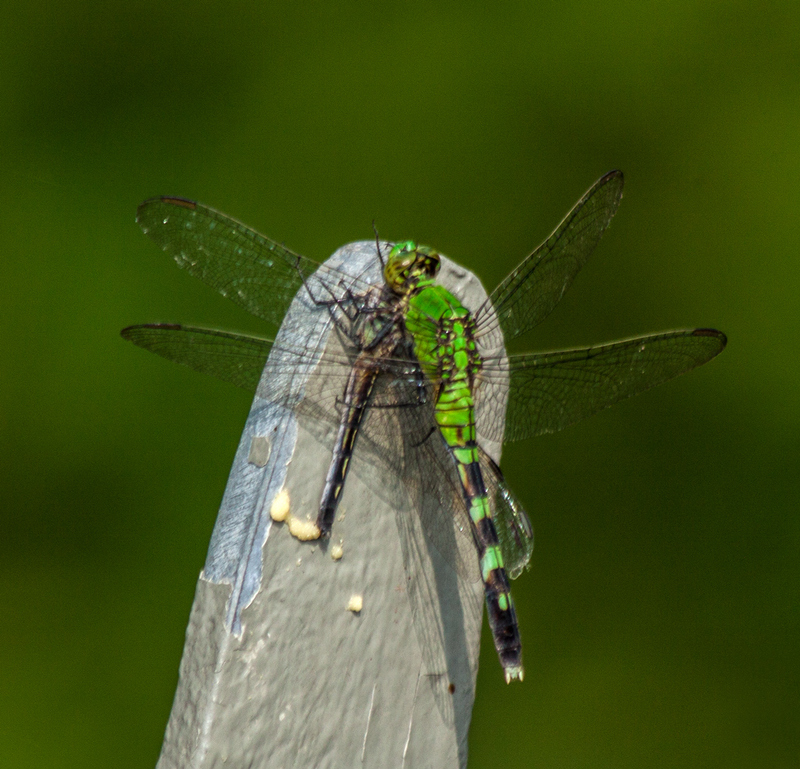 The dragonfly is perched on the end of one of the slats of a railing that along the edge of an inclined section of the boardwalk. I cropped the image to focus viewers’ attention on the dragonfly, but I also like the second version of the same photo, which is close to the original view when I took the shot. Somehow those three slats remind me of a row of tombstones, a memorial to the predator’s prey. I never realized that I was surrounded by cannibals. No, I did not discover a pile of skulls or a string of shrunken heads, but almost every time recently that I have gone out into my local marsh, I have spotted Red-footed Cannibalflies (Promachus rufipes).